Maximize your savings with Spectrum internet and get free modem. They'll even buy out your old contract. Get a free modem when you bundle Spectrum’s internet, TV, and home phone services. You must choose one of the three Triple Play (internet, TV, and home phone) packages offered by Spectrum. Use our zip search tool to see if this Spectrum deal is available in your area. If you’re stuck in a contract but want to make the switch to Spectrum today, Spectrum will pay up to $500 to buy you out of your contract. New customers must order a qualifying Triple Play or Double Play bundle, fill out a contract buyout form, and email the form along with a copy of the last month’s bill from the previous provider. Want this deal today? 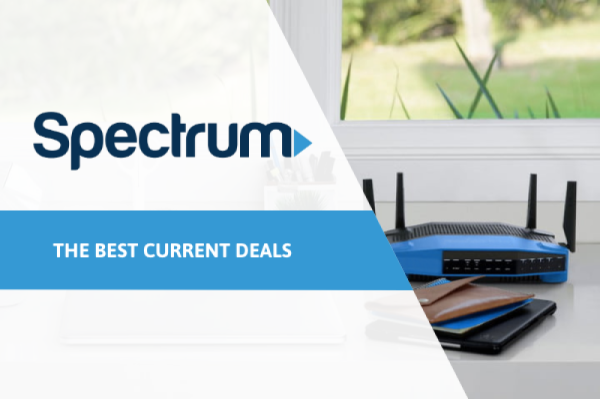 Click to see if Spectrum offers and promotions are available in your area. Where it's available: Spectrum is available in 41 states. We make it easy to check Spectrum availability in your area. What's better than Spectrum buying out your contract is the fact that this provider also doesn’t make you sign a contract, so if you’re unhappy with your services, you can easily cancel and find another provider that aligns with more of what you’re looking for. They also offer a 30-day money-back guarantee so there’s nothing to lose when you switch to Spectrum internet. Where it's available: Spectrum is available throughout the nation, but California, Texas, and New York have the most coverage. We’ll help you check which internet providers are available in your area. On Demand: There are up to 30,000 On Demand titles that you can watch in the comfort of your own home and on the go with the Spectrum TV App. This triple play bundle gets all the perks of Spectrum internet and TV along with hidden savings when you get a home phone. Spectrum Voice comes with unlimited local and long distance calling in the U.S., Mexico, Puerto Rico, and more. A Spectrum home phone only costs $9.99/mo when bundled, making it a better option for kids that are too young for a cell phone. Your home phone can also double as a business phone if you work from home. Not to mention the value of a home phone is priceless during times of emergencies since they can work even when there’s a power outage. Where it's available: Spectrum Internet and TV packages are available in almost every state. Use our comparison tool to check current deals and offerings specific to your location. On Demand: Spectrum offers up to 30,000 On Demand TV shows and movies for your enjoyment. And with the Spectrum TV App, you’re able to stream all your favorite titles on any of your mobile devices, including tablets, laptops, cell phones, and video game consoles. A Spectrum login gives you access to over 80 different network apps some of which would normally cost around $10/mo each, like CBS and NBC Sports. If you’re a die hard Game of Thrones fan and can’t live without your HBO streaming service, Spectrum TV Silver package comes with premium channels included. This makes streaming on HBO GO, SHOWTIME, and the NFL Network a piece of cake. You also get the added convenience of having your TV entertainment and internet service on a single bill. Frontier’s fiber internet and TV packages are comparable in price, but fiber is not as widely available as Spectrum’s cable internet. Premium channels like HBO and SHOWTIME also cost extra and don’t come included. If you want the ultimate sports entertainment to go with your internet experience, AT&T internet with DIRECTV makes a dynamic duo. *INTERNET SPEEDS: Internet speeds may vary by address; small percent of customers will receive lower than advertised speeds. No data caps or capacity allowances. Spectrum Internet subscribers are required to use non harmful devices in order to use Charter's network. *SPECTRUM CONTRACT BUYOUT: To qualify for the contract buyout program, a customer must order and install a qualifying Triple Play or limited Double Play promotion; offers not available in all areas. Offer available to qualifying customers only who have no outstanding obligations to Charter. Check amount will be determined by the early termination fee on the final bill from the previous provider, not to exceed $500. For contract buyout qualifications, go to Spectrum.com/buyout.